Lay back into luxury with this opulent white pillow by European Heritage. 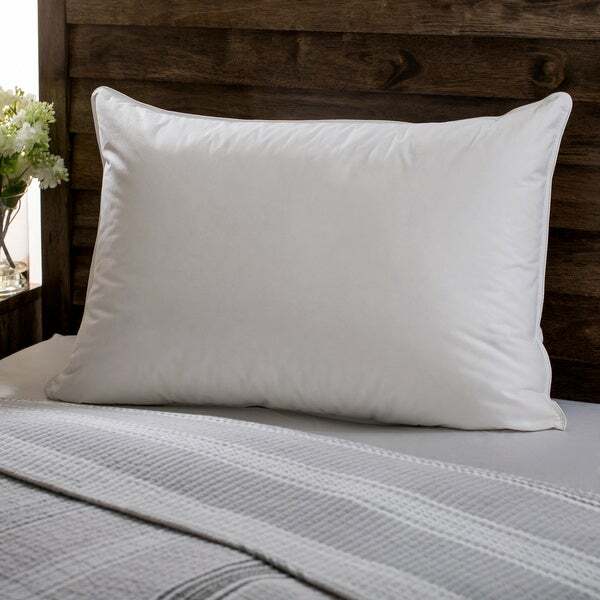 Stuffed with light and fluffy goose down in a medium firmness, it cradles your head as you read, sleep, or relax. This European Heritage pillow offers an excellent balance between support and comfort. Piped edge construction makes this item durable and able to hold its shape. Discover the clean, soft feel of its 300-thread-count cover each time you lay your head down. Suitable for sleeping on your back, this cushy pillow makes drifting off to dreamland soothing, simple and indulgent. Fluff it up as needed by massaging the surface while shaking it gently. I've been using this pillow for well over a year now and it is holding up very well. It shapes to whatever I need for side or back sleeping. I don't like a pillow to push my head up so my chin is pushed into my chest so this is perfect for me. I can shape it to keep my neck straight no matter what position I am in and it regains its shape with a quick fluff in the morning. The padding on top is too thin. Otherwise OK. I have finally found the perfect fill for my down pillow. I'm happy. "Is this pillow stuffed with 100% goose down?" My family loves white goose down pillows and it was time to replace ours - these fit all of my criteria at a good price.